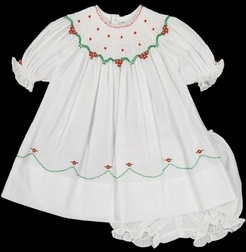 This precious bishop smocked Christmas dress by Feltman Brothers for baby and toddler girls features lovely diamond smocking and hand embroidered roses and leaves in red and green. There is lovely red stitching trimming the neckline. 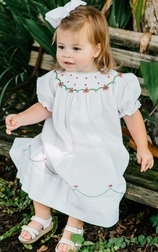 Puffed sleeves with an embroidered rose buds on each and French lace trim gives this classic holiday dress a vintage feel. 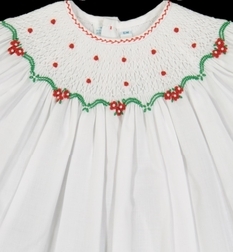 Along the lower portion of this little girls holiday dress, just above the hem, there are three rows of fine horizontal pin tucks. Directly above the pin tucks are beautiful embroidered rose buds.